Pat Kirby answered his country's call to arms during the Vietnam War, serving multiple tours, suffering injuries, watching friends die. Today he has a letter from the VA telling him that because his wife takes care of their family finances, he is deemed "incompetent" and for this reason, he has to turn in his guns and relinquish his 2nd Amendment Rights, or face going to prison. It's like a bad flashback to the attitudes that led to the creation of Rambo. Veteran discrimination has not been this pronounced in years, it seems the Vietnam Veteran is always asked to take a harder road than those who served both before and after them. Suicide rates of Vietnam Veterans are astronomical, much like their brethren from the current wars. These are all reasons not to humiliate and shame Veterans, of all people, without justified cause. After returning from military service in Vietnam, Pat Kirby married his wife, Susan, and had a family. Pat lived what so many call The American Dream. It went pretty well, considering that Pat suffers from PTSD (Post Traumatic Stress Disorder) which, according to Dr. Phillip Leveque, who as a Physician treated approximately 1,000 PTSD Veterans at his practice, "Goes hand in hand with multiple combat tours -- years of service with a rifle in your hand." Most Americans agree that those who serve their country under the most dangerous conditions, deserve their nation's gratitude. That system of belief is falling to the wayside. The American Legion, the country’s largest organization of wartime veterans, will return to Roseburg on Feb. 11 to host a second town hall for veterans to discuss the quality of health care they are receiving at the city’s Department of Veterans Affairs (VA) medical center. Members of the Legion’s System Worth Saving Task Force last met with local veterans at a Jan. 9 town hall meeting. One major concern expressed by several attendees was the closing of the VA facility’s intensive care unit (ICU). The follow-on meeting is scheduled for 7 p.m. on Feb. 11 at American Legion Post 16 on 406 S.E. Oak St. in Roseburg. Anyone with concerns about VA health care is encouraged to attend the meeting, especially those who have served in the U.S. military. Members of the Legion’s System Worth Saving (SWS) Task Force will facilitate the event. The SWS program was created in 2003 to monitor the quality of health-care at VA medical facilities nationwide. For more information on the town hall meeting, contact Ed Lilley at elilley@legion.org. As I have detailed in previous reports, elements of the federal government have been spending billions and billions finding ways to cause states to relinquish private information, specifically mental health records, and records for minor drug offenses. The govt. is using the information specifically to deny gun ownership. Pat Kirby and his wife Susan are at the forefront of a national event and they are supported by large numbers of well equipped Americans who want to preserve the right to bear arms and the overall rights of Veterans who served their country with distinction, men like Pat Kirby. The first video I produced about Pat Kirby and Susan and their efforts to halt this government seizure of basic rights it is tracks, had just accumulated over 23,000 views, when YouTube pulled it from our site, and then, quite oddly, re-added the video within only half an hour, but when it went back up there were zero views. What kind of games are taking place? Others have pointed to the new video not holding visitor counts, I have been told the number has gone backward. So, just be aware that this is taking place, there is no good reason for this to have happened, and it seems likely that the government is playing the non publicly responsive YouTube like a song. The video is also going to be loaded on Vimeo, a much more stable site than YouTube, it is sad when political opponents must work in dark ways. I hope as many people as possible make it to the meeting in Roseburg, it is a follow up meeting from a few weeks ago, the last one ended in a disastrous shouting match, representatives of various Oregon senators and politicians were no shows, people were gravely disappointed. But this is put on by the American Legion, they are really trying to get to the bottom of some issues and supporting their mission and participating, and helping them help Veterans, is only a good idea. Thanks Tim. Disturbing story but only one of many. Every married couple I know has one person handling the bills. It is easier for one person to handle and pay them. My attorney wife would be horrified if her legal competency hinged on who payed the bills each month. We generally split the cost, and she gave me a check each month for half. I wrote checks (or online) and made the actual payments on our common bills. We each had some separate CCs we handled ourselves. 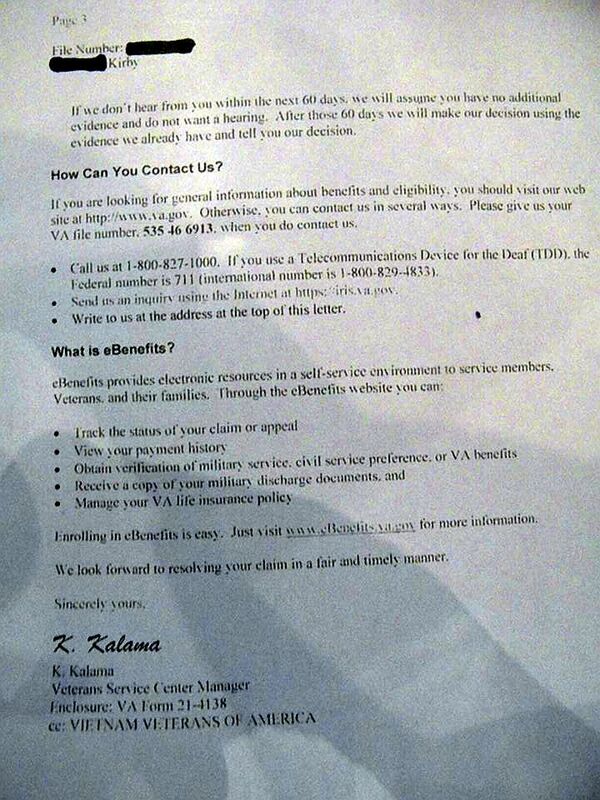 This is a back door way to disenfranchise people receiving VA benefits from their fundamental rights. If you watch this video and read the article at the link below this you may notice that many of the traits that are most concerning about those with PTSD, are the VERY SAME TRAITS taught by almost every training course to the general public who elect to carry a weapon concealed for personal defence. If you've taken a CCW course you have been encouraged to practice the very same behaviors that the government and medical community declare make you unfit to own or possess weapons. I really think this ought to merit serious discussion among the gun owning community and specifically those who carry concealed or own firearms for purposes of self defence. 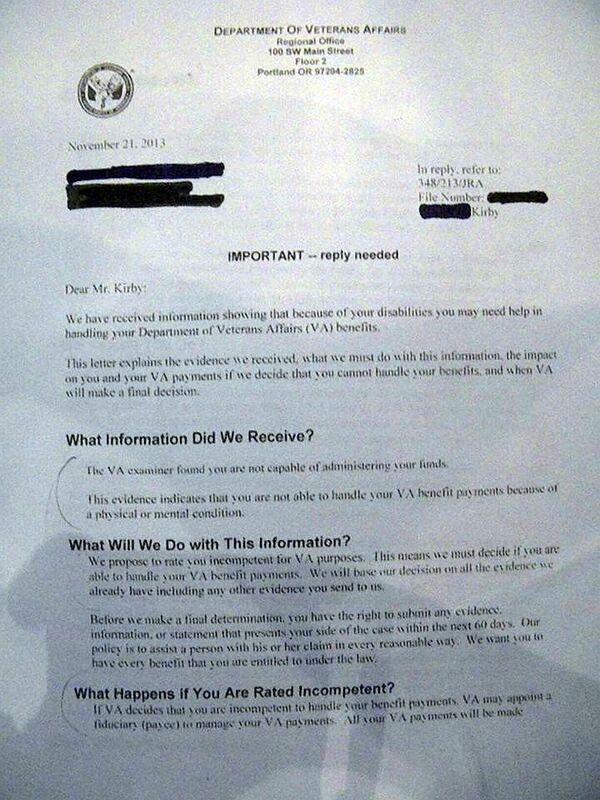 Please post a copy of the VA letter again. We still have doubters. The whole point of this story is, they are taking veterans gun rights away without adjudication. It's true, I have done my research. Over 160,000 have lost their rights without having their day in court. The veteran above doesn't even have a criminal record. He is not a danger to himself or others.They withhold pending retro pay until the veteran caves. I believe the word for that is extortion. They will be published shortly, thank you. "elements of the federal government" better be in Moscow by January 22, 2017. Pat,give them 1 or 2 of your least favorite firearms. Keep the rest. Viet nam was a CIA op. that got out of hand,which is the goverments problem,not yours. My husband is being treated the same way but for diseases! Vietnam Veterans are being so screwed! God Bless all Veterans & the Salem News for doing this interview! Regarding the comments below about the thousands who lost their 1st Amendment rights from guns: Millions have all their Bill of Rights because of guns, or whatever was needed to see that they were not taken away. There is evil in the world, and it will never go away. Keep in mind that the veteran that this article is focused on never had to deal with this sad situation in previous administrations. 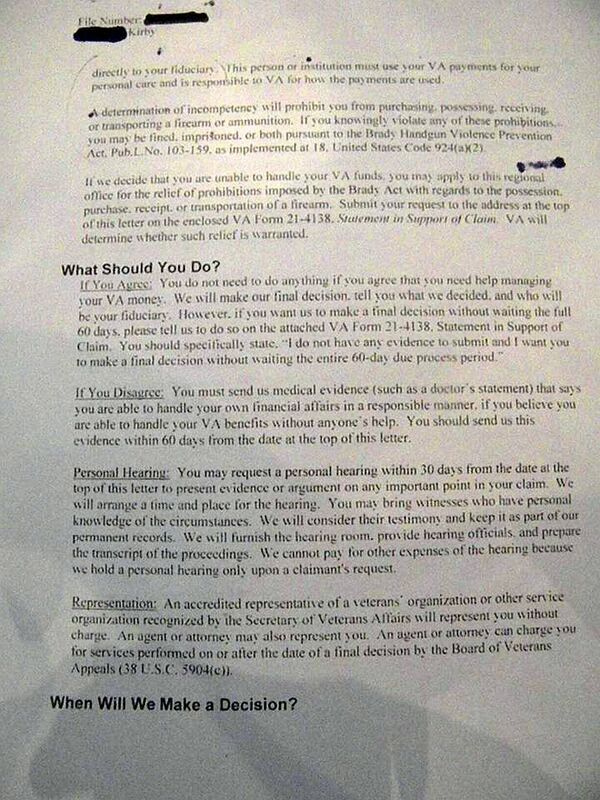 The VA gets it's marching orders from the Executive branch, so who has the "buck stop with them?" Last 5 years we have seen a steady deterioration of not just the 2nd Amendment, but other rights also. Focus, which party and its various members have been attacking the 2nd Amendment and have steadily been creating laws where confiscation is the endgame. Gun crime has been going down while gun sales are at record highs. Veterans, especially combat veterans, are very low offenders of gun crime, so why is the above-referenced party saying otherwise? Please vote for those who want our Bill of Rights to be upheld. Thank you. I am also a Vietnam veteran and one of our biggest beefs is when we are maligned via stereotypes. Simply google "Myths about Vietnam" to see how these many myths have been corrected. For example, after returning from Vietnam there was certainly high suicide rates, but after 5 years it fell significantly below our same age cohorts. Also we had a very low incarceration rate, and unemployment rate. Many early surveys asked prisoners if they were Vietnam vets, and after seeing such a high rate, a more formal investigation took place. We were lower than any other veteran group. The myths go on and on, so please take the time to develop more accurate info. Thank You. The VA cannot take away anyone's Constitutional Rights.